While I was at the Walt Disney World gift store in the Orlando airport on Saturday morning (coming back from our Disney Cruise), I stumbled across another brand new set of Pixar MagicBandits...this time Up themed! A few weeks ago I posted the newly released Finding Nemo 3-pack, having no idea this one was out there too. I have yet to even find any info [whatsoever] on this set online. Ever since MagicBandits became a thing at Walt Disney World, people have actually asked me several times if there were any Up themed ones out there. Well, I'm happy to finally be able to say- "why yes, there are!" This is a really cute set- featuring young Carl, Ellie and the Grape Soda pin (or "The Ellie Badge"). If you've never heard of these "MagicBandits", here's the scoop. 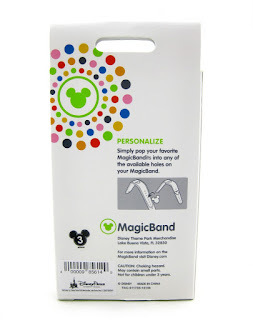 They're basically just little vinyl charms that snap into the extra holes of your magic band (check out the back of the package above) to add additional pops of color and personality. Many different Disney characters are available! Honestly, when I first saw these at the parks, I thought they were kind of a pointless way for Disney World to make extra money (I know, not my usual positive outlook). I was like"these are lame, who would buy these." However, that thought didn't last more than ten seconds once I saw Pixar themed ones were available. Check them out attached to my Magic Band below! They look great. 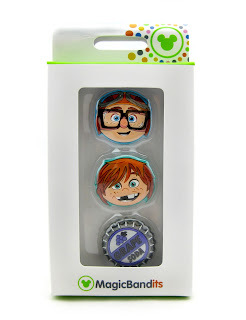 The first Pixar Bandits I ever saw in the parks were the Monsters Inc. ones, which sold me on the idea of these things. 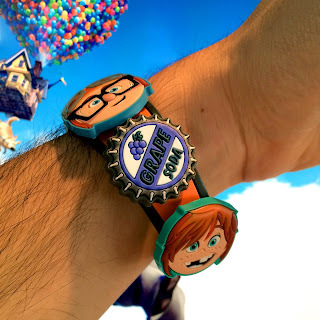 I thought it would be fun to add some of my love for Pixar to my magic band and my overall "ensemble". After finding those, I was hooked and looked for more Pixar related Bandits. I then found a fun Cars 3-pack and then found out there was a rare/sold out Incredibles 4-pack (which I got online once I got home). Earlier this year, a Toy Story themed 3-pack was released as well as the aforementioned Finding Nemo 3-pack (released just last month). At this point, I'll be able to wear a different Pixar movie on each day of our next Disney World trip! You may be wondering if these stay on well. Yes, for the most part. Once you pop them on, they're pretty secure. They can snag on things, however, and pop off (I had that happen once or twice, for example getting off of Rockin' Roller Coaster). For the most part though, you won't have to worry about them falling off. Getting these for young kids though may be a different story, since they could easily rip them off and toss them aside. I definitely wouldn't get them for kids under six or seven, but it totally depends on the kid of course. Just in case you do plan on getting these Bandits for very young kids, be aware that they can easily be snagged on something or pulled off and lost. You can currently find this set at the Disney World gift shops in Orlando (including the one at the airport, as I mentioned). I'll post links here as soon as I see it's available online! NOTE: While I was browsing the MagicBandit section there at the store, I also saw another Up themed character I didn't know about...Dug! Unfortunately, he was in a 3-pack with two other non-Pixar dogs. It would have been cool if he was included here with this set! Oh well.